Organza dotted with silver accents. Silver bead center. Crinkled taffeta with pearl center. I tried different flower designs and fabrics and had so much fun doing it, I just had to share what I learned. The flowers on this page are just the start. I know I’ll be adding more as I continue to experiment. Both the pink and the teal flower were made the same way. You’ll find the directions below. What’s really interesting is that the fabric texture and weight play a big role in the final outcome. The sheer pink organza fabric is dotted with flecks of silver. The very light weight of it tended to make the flower go flat so I added 3 more layers to build it up. The teal flower with a pearl center didn’t need extra layers. Crinkled taffeta gave it lots of body. In addition, the Crinkled effect also added a great deal of interest because the pedals tend to turn and bend on their own, resulting in a very unique design. I will be playing with fabrics and techniques and will publish more soon. So many ideas, so little time! step 1 - Cut out fabric squares, two of each measuring - 3.5”, 3”, 2”. step 2 - Align both 3.5” squares. Fold them in half once, and then again. step 3 - Pin together close to center or sew a stitch or two by hand at the center point. step 4 - Round off the left and right angles. If necessary, pin layers together to avoid them slipping. Trim stray or frayed edges. step 5 - Cut all folded edges to a distance of about .50” from the center point. step 6 - Lay the layers flat, then pull one bottom pedal up through the slit in the top petal. Do this to all 4 bottom pedals and set aside. step 7- Repeat steps 1-6 for the other size squares. step 8 - When all squares are complete, stack them with the largest on the bottom and the smallest on the top. Bring a needle through all center layers with 2 or 3 stitches to secure all layers together. 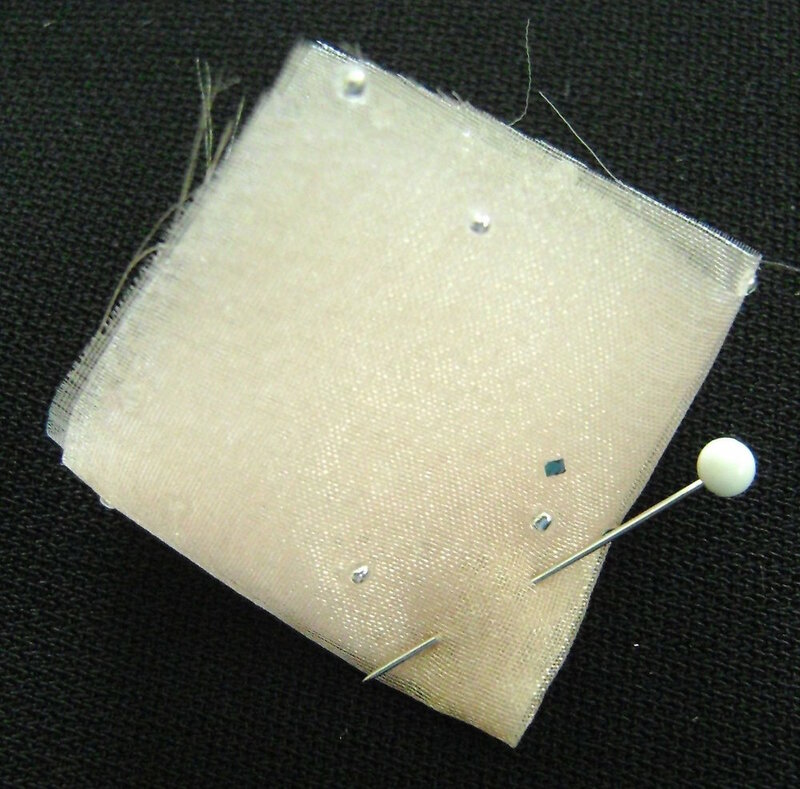 step 9 - Finish by sewing beads or pearls in the centers and attaching a pin on the backside with glue or stitches.